As part of Spaces for Change’s effort to promote awareness on political, economical and social issues, to continue to work to inspire young people to embrace new ways of thinking and acting by helping them understand the significance of their participation in public decision making and also to engage the youth populations and disadvantaged groups with a history of non-voting including those communities least likely to be reached by traditional voter outreach methods, Spaces for Change (S4C) launched an intense voter education campaign for secondary schools, communities and youth associations in Lagos State. 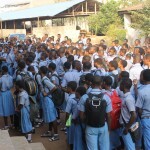 The initiative aimed to target youths in schools and tutorial centres across the state that are yet to register to vote in the coming elections because they were under aged during the last election in 2011 and have not registered because they are unaware of the process or have decided not to engage in the process because of security concerns. By 7:40am exactly, the S4C team was called and the voter education program was held. S4C emphasized on the need for the registration of students who had just clocked 18 or were already above 18. Students were also told to be of their best behavior during elections, avoid violence situation and were also told to shun electoral malpractices and violence in all its manifestations such as thuggery, snatching of ballot boxes and so on. The students listed with rapt attention and when asked intermittently by the S4C team to repeat what had been said they did so without fail.